Feel the gentle touch of a cool mountain stream. Discover signs of Ancient Life in the Gorge Forest. Our clear country air reveals the majesty of a million twinkling stars. Our resident pair of Black eagles had a Chick in the nest, it has now flown the nest, so now we watch 3 Black eagles flying, what a sight to see every day. This incredibly exclusive, private place in the Mpumalanga Escarpment offers an escape from the bright city lights. Marvel at the expansive night sky and fall asleep to the sounds of the night in our Luxury Lodge Suites or one of the self catering accommodation options available. A wonder for the Nature lover! To check availability or make a booking now, please use our "Book Online" facility. You can also send an email or use the form on Reservations page. Enjoy your nights in the luxury suites, including a 4-course dinner and breakfast. Self-catering guests are welcome to book meals at the lodge, or bring your own food. Enjoy quiet forest walks, or day-trips to nearby tourist attractions. Historical influence is evident everywhere in Mpumalanga, from the legendary King Solomon and Queen Sheba to the ancient floating villages of Chrissiesmeer. On this magnificent piece of land we hope we have catered for everyone, from Luxury guest suites at the main lodge* to the Forest Cottage, Bee Eater, The Beach Cottage & Sunbird self catering options. During the cooler months, come and enjoy the Big Fireplace in the Lodge Lounge. There are hiking trails along the stream under the canopy of trees. Treat yourself to an hour or two of relaxation in our Forest Spa - Click here or on the link at the top of this page for details. Wi-Fi is available on request at the Lodge, or bring your own portable 3G connector. * Please note: to ensure your privacy, Lodge Suites are not adjoined to the main lodge, requiring a short walk to the communal lodge areas. Forest Creek Lodge is a haven for honeymooners - celebrating your first, fifth or fiftieth, you will be inspired by the romance of this incredibly exclusive, private place. We originate from Natal, and over the years we have had the opportunity to live and work in some wonderful places: Zimbabwe, Mozambique, Namibia and lastly Mpumalanga. Mush and Anita first came to Mpumalanga in 2002, we spent many a month looking for the right property to build our dream, it was by chance that we stumbled across Forest Creek. It took us two years to build our little lodge, taking as much of the natural materials available to create this lodge. We opened in 2004 with Michael & Maxine Daniel’s wedding, which was a success. Our first application for our star grading was in February 2005. Relax and be pampered in our small spa. Treatments can be booked during your stay. Open from 10am to 5pm. Our reply is, if one was in Dullstroom (the town closest to us as the crow flies) and 'jumped off the mountain', you would land in our gorge. See Map on Contact page for directions. Forest Creek Lodge has earned superior gradings and high ratings from various tourism-related initiatives. 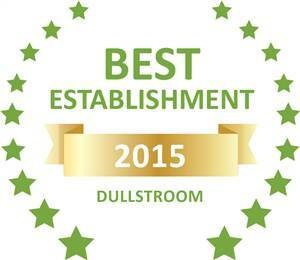 Based on reviews of establishments, Bee Eater Self Catering Unit has been voted Best Establishment in Dullstroom for 2015. TripAdvisor's Certificate of Excellence is awarded to establishments that consistently earn great reviews from travellers. 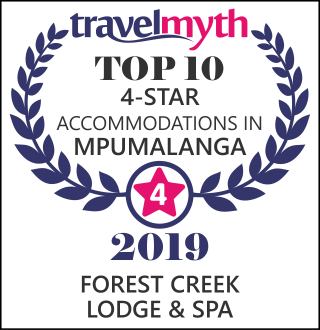 Forest Creek Lodge & Spa was awarded Best Pet-friendly Accommodation and Favourite Small Hotel in Dullstroom, Mpumalanga. 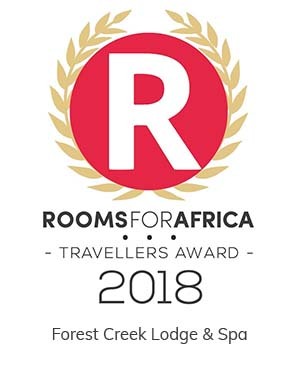 Forest Creek Lodge & Spa for Self Catering in Dullstroom has received a 2018 Certificate of Excellence Award. Read more comments in our Guestbook. Thank you and your team for the amazing service and hospitality. From the stunning room, beautiful lodge and magnificent views and forest. We had the most amazing time. Thank you very much for the lovely break... 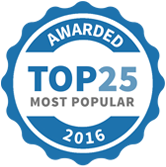 Please say thanks to all your staff as they do a great job and always made sure we were happy with our stay. We really enjoyed our brief stay with you, the cottage was lovely and it was a perfect way to relax after a long journey.